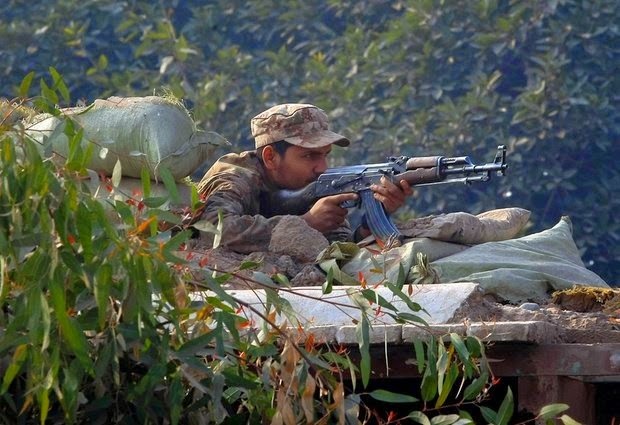 A Pakistani army soldier takes position on a bunker close to a school under attack by Taliban gunmen in Peshawar, Pakistan, Tuesday, Dec. 16, 2014. The attack began in the morning when the gunmen entered the school and started shooting at random. Army commandos quickly arrived at the scene and started exchanging fire with the gunmen. Students wearing green school uniforms could be seen fleeing the area on Pakistani television. The extremist group is made up of fighters who largely have been based in North Waziristan, a northwestern tribal region bordering Afghanistan. They have been battling government troops in the northwest since Pakistan aligned itself with the U.S.-led war in Afghanistan. But the Pakistani Taliban didn't officially form until 2007 as an umbrella organization that included various militant factions, all aligned against the government. In recent months, the organization has fractured amid a Pakistani military offensive and U.S. drone strikes that have raised tension in the ranks. Known as the Tehreek-e-Taliban Pakistan, or TTP, it is headed by Mullah Fazlullah, a militant commander who claimed responsibility for trying to kill education activist Malala Yousafzai in 2012. The teenager survived the shooting and won the Nobel Peace Prize. The TTP has vowed to overthrow the government and install a harsh form of Islamic law. The extremists are aligned with the Afghan Taliban — a group fighting U.S. and Afghan forces in Afghanistan — as well as al-Qaida militants who also live in the rugged northwest. They have frequently attacked Pakistani troops, government targets and civilians to help carry out their goals. Tens of thousands of people have been killed in the violence, but Tuesday's school assault was one of the deadliest in more than a decade of fighting. WHAT HAS PAKISTAN'S GOVERNMENT DONE TO STOP THEM? Pakistan's military has carried out numerous operations in the tribal areas over the years, and more than 4,000 soldiers have been killed, with thousands more wounded. But many Pakistanis have tired of the operations and question their effectiveness. Prime Minister Nawaz Sharif, elected in 2013 partly on a platform of promising to negotiate an end to the violence, has tried for months to talk to the militants with little result. When militants attacked the Karachi international airport in June, the violence shocked the country. The government began an offensive in the militant hub of North Waziristan — the last remaining tribal area where the military had not launched an operation. Pakistan says it has killed more than 1,000 militants in the operation, which displaced hundreds of thousands of people.